I wanted to check here to see if a repeated measures ANOVA would be a good option to analyze my data, or if you have any other suggestions? I have read that GLMM is another option for time series data, but my data is not linear. I use R for analysis. I counted the number of flowers (Total) on 168 plants every other day (Day), so repeated measurements on the same plant subjects (PlantID) evenly spaced through time. I had 4 Treatments: Early, Peak, Late and Control, which differed in the timing that a heatwave was applied. I used 4 growth chambers to grow my plants, with 42 plants in each chamber. There was one chamber for each heat treatment. I used 6 genetic lines of this plant (RIL). I am interested in determining if the shapes of the 'flowering schedules' are different across RIL and Treatment combinations. Do control and treatment plants differ in their response to heatwaves? How do the genetic lines differ in their response? For example, do Control/RIL10 plants differ in their flowering response compared to Early/RIL10 plants, and so on for all other combinations. I included a figure of my data to better illustrate this. Each gam curve represents the average flower counts for one RIL over time. The green curves are Control plants, the red curves are the Early plants. I would basically like to do a post hoc test to see which curves are significantly different from each other, and where they differ, if possible. Here is an example of my data. 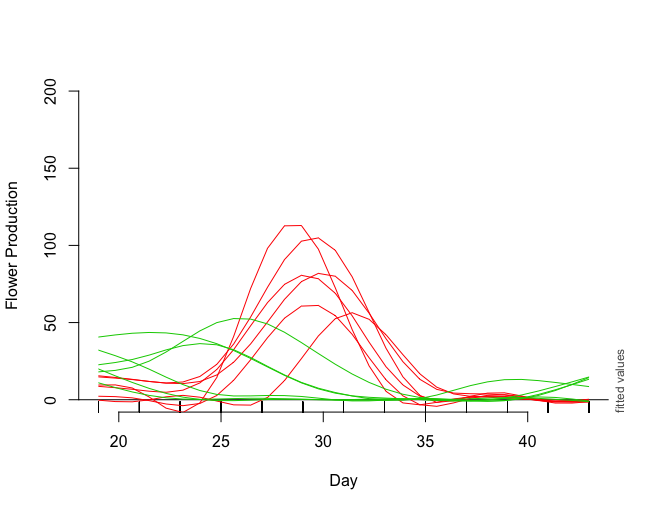 Day starts at day 19 because this data is a subset for flower production after the early heatwave ended. This is the flower counts (Total) over time (Day) for plant #85 in the Early heatwave treatment and belonging to RIL 206. If you would like a larger sample of my data to look at please let me know. You seem to have repeated count data, i.e., the number of flowers per plant. Hence, you could use a Poisson-type of regression model. To account for the correlations in the repeated measurements, you could use a GEE for count data or a mixed effects Poisson regression. The choice between them depends on several factors, i.e., if you have missing data or if you're interested in coefficients with a marginal/population interpretation or a subject-specific one. Both types of analysis are available in R.
You could find more information about these models in Chapters 4 & 5 of my Repeated Measurements Course notes. Not the answer you're looking for? Browse other questions tagged time-series repeated-measures glmm gam longitudinal-data-analysis or ask your own question. Random or fixed effects? GLM or GLMM? Choosing GLM or GAM for my daily flower production data in R? GAM: Plotting gam models of different treatments?